eCite - Could Image Processing Enable Reduced Acoustic Noise during MRI Scans? 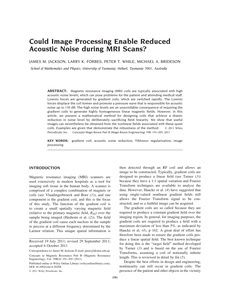 Could Image Processing Enable Reduced Acoustic Noise during MRI Scans? Magnetic resonance imaging (MRI) coils are typically associated with high acoustic noise levels, which can pose problems for the patient and attending medical staff. Lorentz forces are generated by gradient coils, which are switched rapidly. The Lorentz forces displace the coil former and promote a pressure wave that is responsible for acoustic noise up to 130 dB. The high noise levels are an unavoidable consequence of requiring the gradient coils to generate highly homogeneous linear magnetic fields. However, in this article, we present a mathematical method for designing coils that achieve a drastic reduction in noise level by deliberately sacrificing field linearity. We show that useful images can nevertheless be obtained from the nonlinear fields associated with these quiet coils. Examples are given that demonstrate the robustness of the method.